A drawing of a skull viewed obliquely from above and the left, which shows the intracranial nerves and vessels. Annotated with notes on the importance of the cranium as the seat of all nervous activities. The drawing on the verso of this sheet depicts two halves of a skull, showing the relations of the different facial cavities, orbit and cheek and nose seen from in front; note frontal and maxillary sinuses and naso-lacrimal canal; there are also small drawings of different kinds of teeth, with notes. 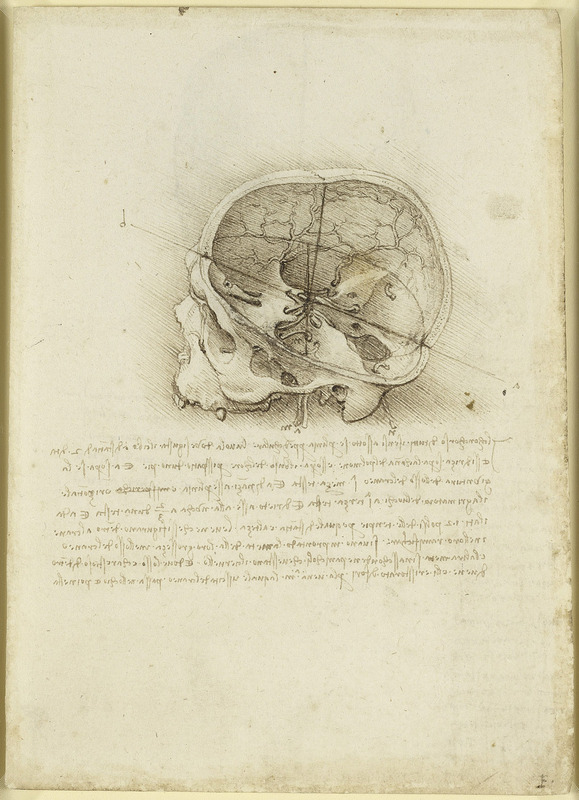 Leonardo’s most brilliant and sustained scientific pursuit was his study of human anatomy. He made hundreds of drawings from corpses that he had dissected in monastery hospitals, recording many anatomical structures for the first time in medical history. The notes on this sheet are in Leonardo’s characteristic ‘mirror-writing’, left-handed and moving from right to left.